Since the beginning of the mass produced automobile, car makers have long sought to create a path of stepping stones with their car lineups. The idea is to catch car buyers at a young age with affordable entry level vehicles and have them stick with the brand as they move through their life. Few companies pulled this off better than Honda did during the late 1980s and 1990s. 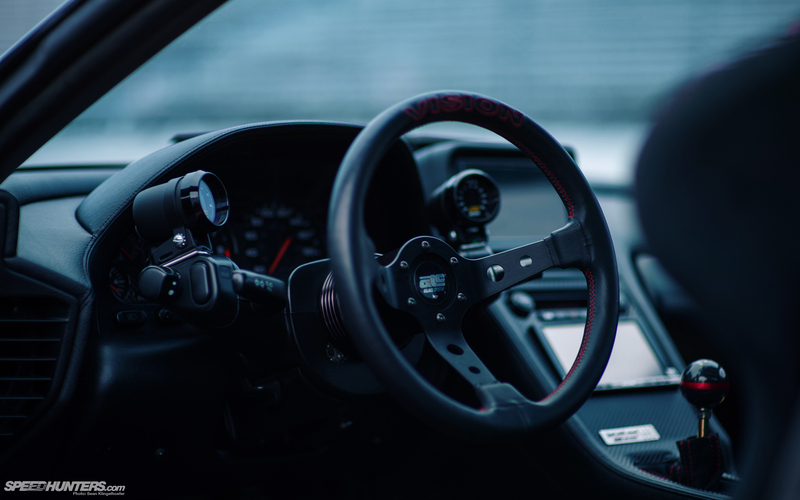 It didn’t matter whether you were a college student on a budget, a middle class working man, a family person or a weekend racer – Honda and Acura had a full line of well-built and ultra reliable vehicles that also happened to be entertaining to drive. An urban commuter might fancy a CR-X, a young professional would dig an Integra GS-R, and at the top of the pyramid sat the NSX. 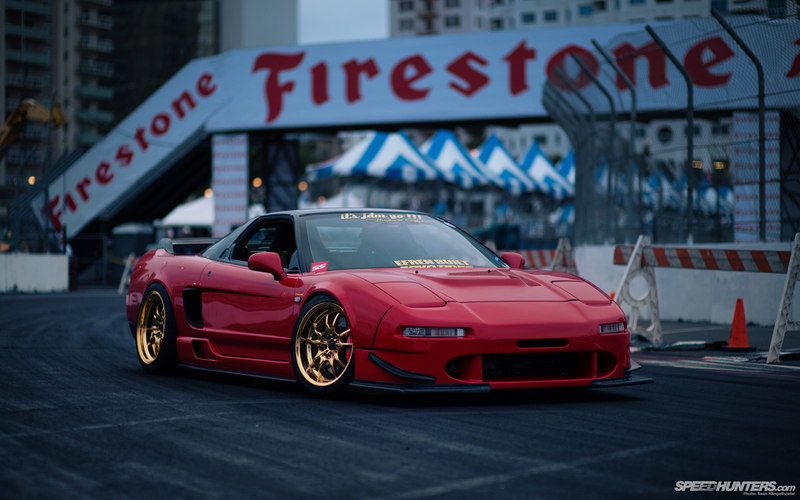 Of course, the mid-engined Aryton Senna-influenced NSX is a fantastic car completely on its own merits, but for those who grew up driving Hondas the sports car represented the ultimate expression what the brand was capable of. It was the perfect halo car. The one you’d dream of while driving your Civic or Integra. That was the certainly the case for Michael Mao, the owner of 1992 Formula Red NSX you see here. 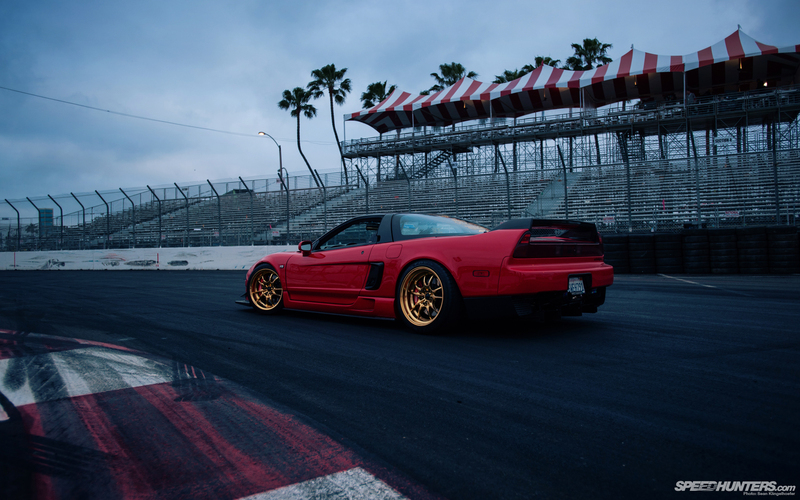 Michael has owned modified Hondas all his life, and he considers the NSX to be his favorite car of all time. 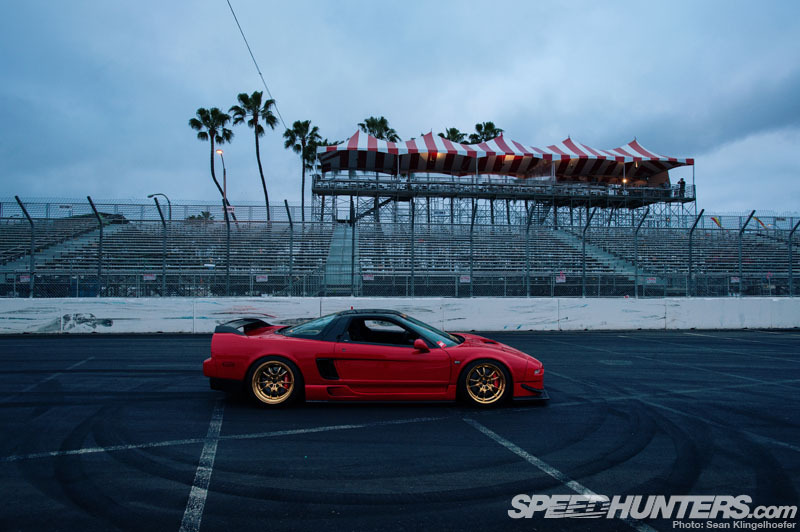 About three years ago the opportunity presented itself for Michael to make his dream reality and take ownership of an NSX. But while some would see obtaining your dream car as the end of the story, for Michael it was jut the beginning. 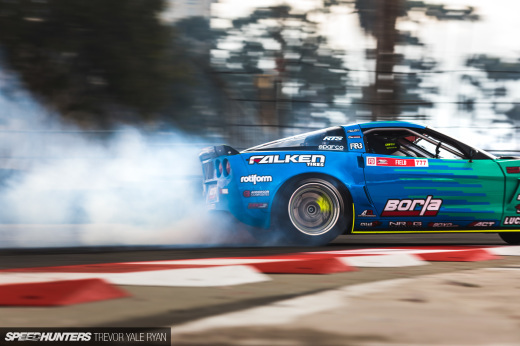 The nature to tweak and modify cars was in his blood, and Michael soon set out to build one of the most unique street-going NSXs out there. 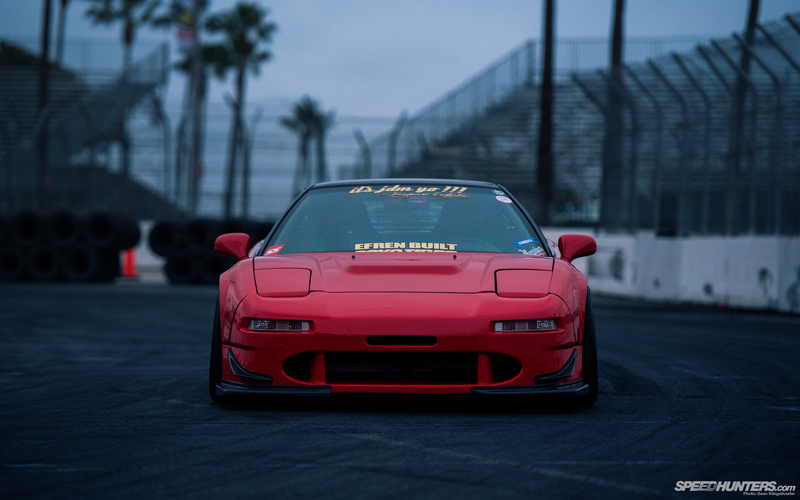 Just looking at the car, it’s easy to see how it caught Sean Klingelhoefer’s eye during the recent Slammed Society event in Long Beach. 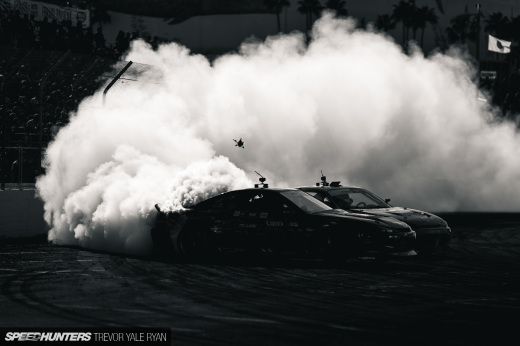 Not only did car take home the Speedhunters Award at the show, Sean pulled it aside for a complete feature shoot. 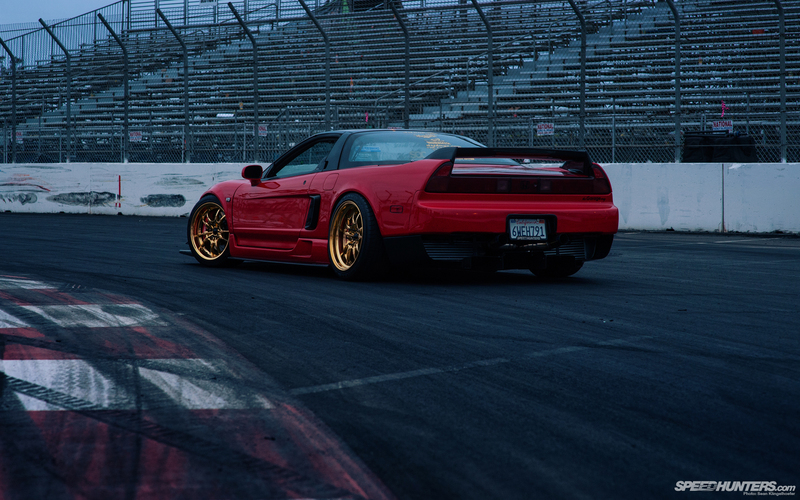 Even when it was released the NSX was never known as a horsepower warrior. It’s twin cam V6 was rev happy and smooth, but power-wise it could never match the forced induction or extra displacement of its rivals. When Michael picked up the car, giving it some additional power was high on his to-do list. 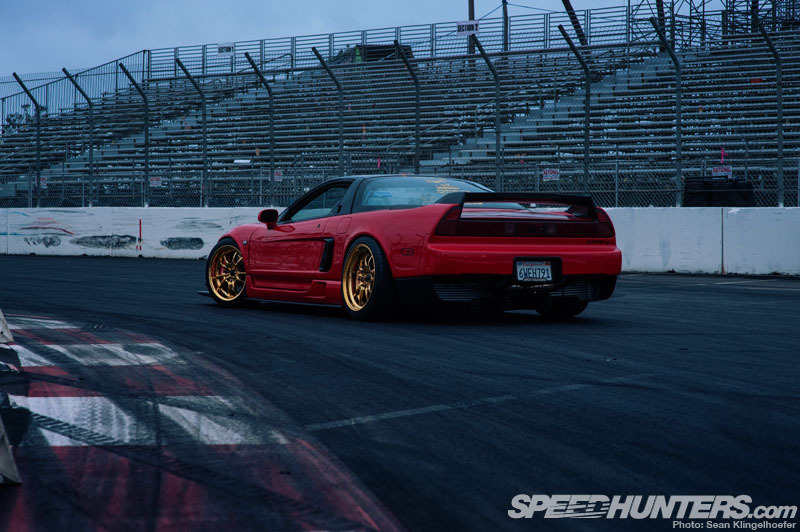 To accomplish this, Michael got in touch with Efren Garcia at Efren Built in Rancho Cucamonga, California, and the two came up with the idea of outfitting the NSX with a one-off twin turbo kit. The goal wasn’t just to give the car more power, but to have a setup that was completely unique to this car. The custom-built kit uses a pair of Garrett GT2871R ball bearing turbochargers on custom-fabricated manifolds with TiAL 38mm wastegates and pair of custom intercoolers. Given the NSX’s engine position, a lot of this work is hidden away out of sight. When looking at the engine, instead of seeing the piping for the turbo setup you see Michael’s Long Beach pride proudly displayed atop the motor – something that’s almost lowrider-esque in its execution. 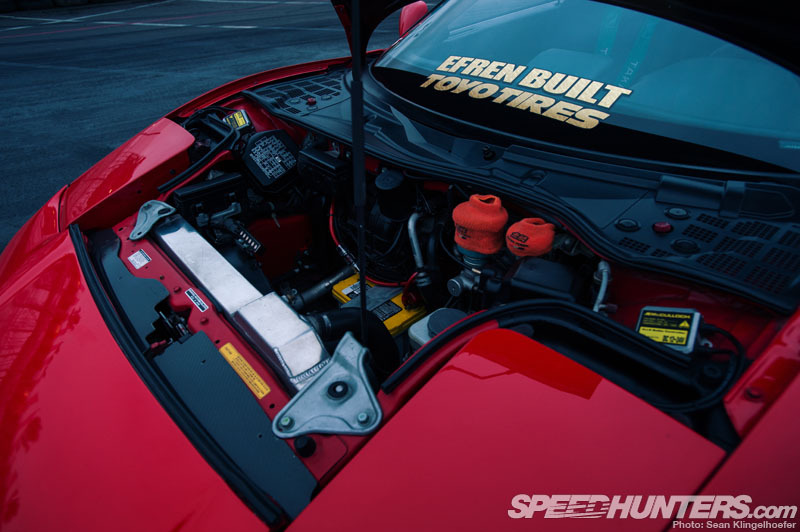 If you get down low and look though, you can catch a peek at the custom intercooler setup, and even more prominently the one-off three inch exhaust that Efren built as part of the turbo setup. 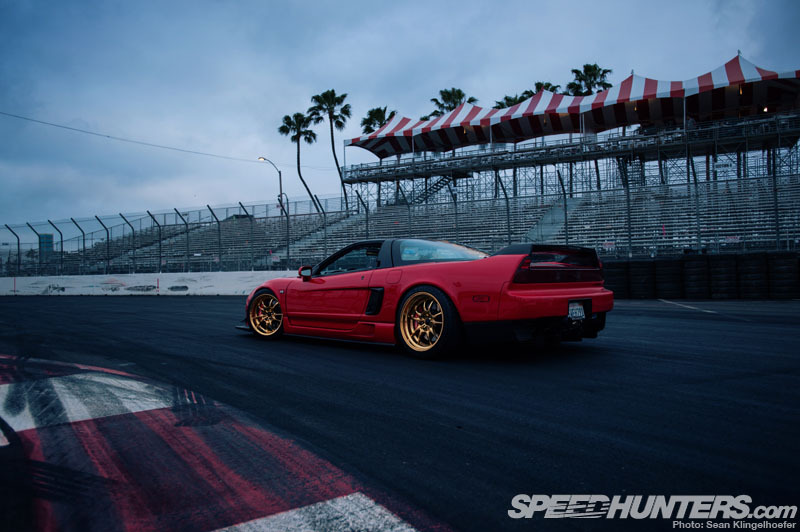 During process of the build, Michael also gave the now 21-year-old NSX chassis some mild re-freshening. Energy Suspension bushings were installed all around, along with a set of sway bars and chassis bars from an NSX-R. The stock suspension was also swapped out for a set of JRZ-RS coil-overs. The stock brakes were dropped in favor of StopTech big brakes in both front and rear. 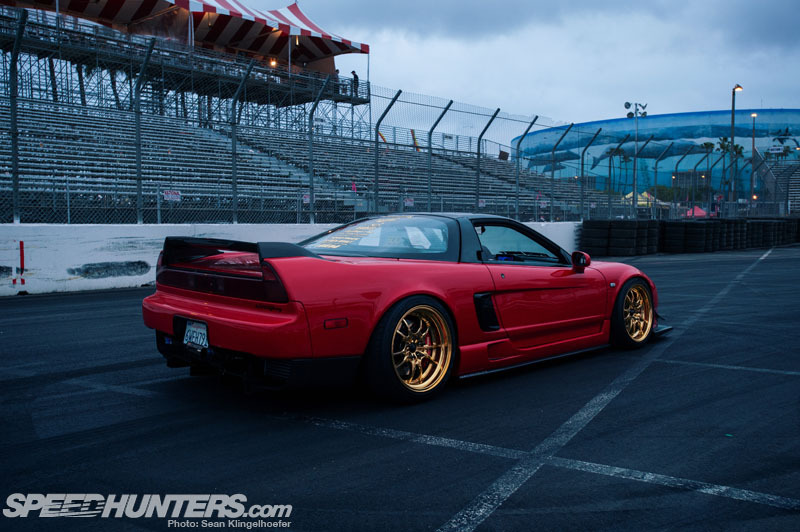 For as good as the NSX looks in factory trim, there’s always room to improve, right? Efren decided to give his car a competition-inspired feel with a Taitec JGTC 2000 front bumper, canards and rear diffuser. For those that aren’t familiar with Taitec it’s a small Japanese company that specializes in NSX parts is also active in the Super Taikyu series. 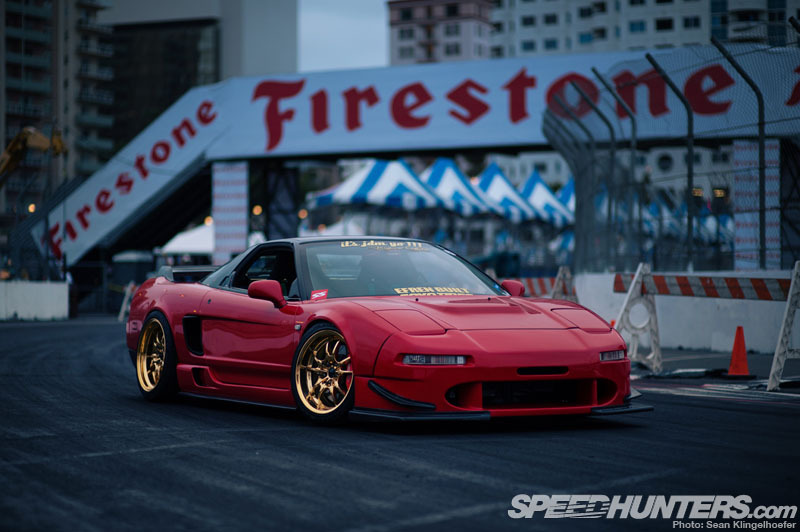 Most of the other body parts on the car from Southern California’s own NSX specialist DownForce USA – including the NSX-R GT style side scoops, side skirts, side diffusers and front fenders that are widened by 10 millimeters. 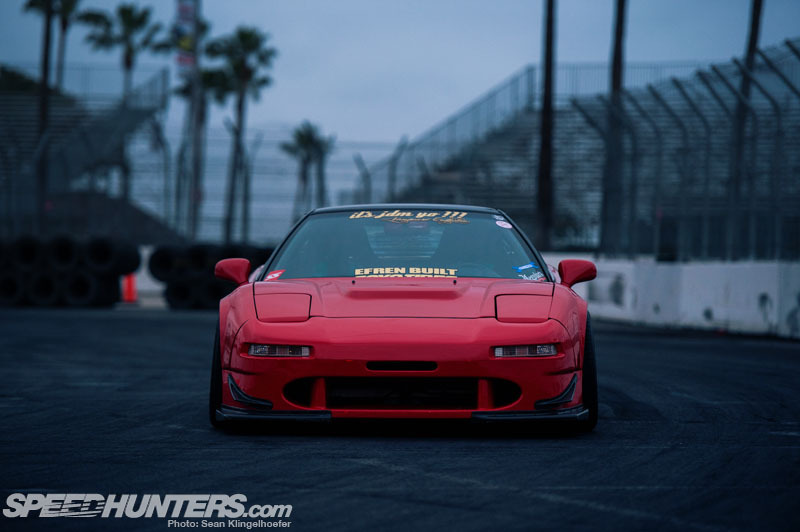 But really it’s the wheels sitting beneath those fenders that truly define the car and set it apart from what’s already a pretty exclusive crowd of modified NSXs. 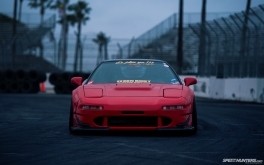 Michael had always been a fan of Mugen parts and wheels, but unfortunately none of the factory wheels were aggressive enough to match this particular car. That’s where a shop called Wheelflip comes in. 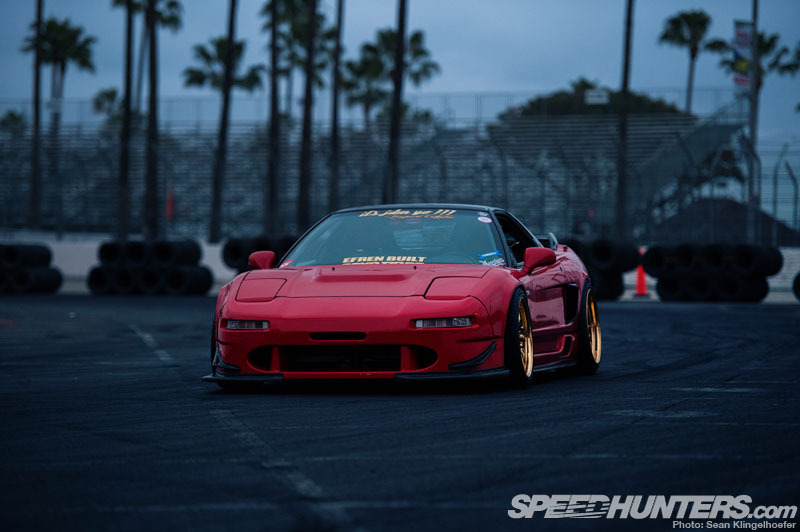 Using a set of Michael’s 17×8-inch mirror-face Mugen MF10s as a base, Sam Kang at Wheelflip re-barreled the wheels to 17×9-inch in the front and 18×10-inch in the rear. 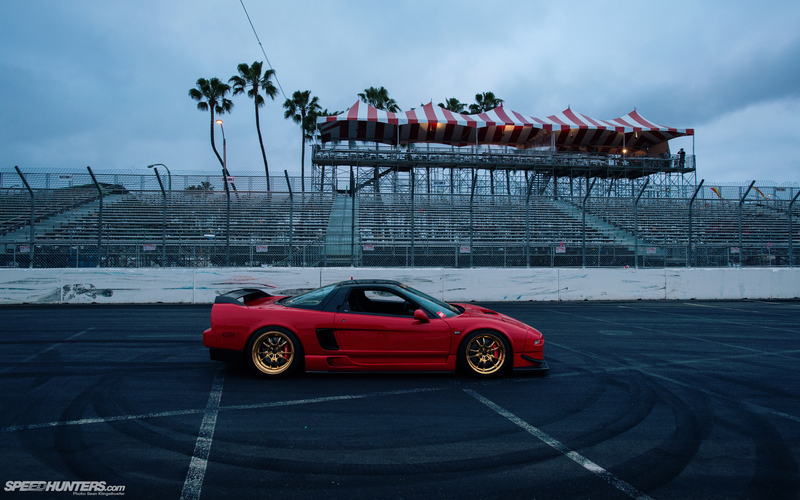 The re-engineered Mugen wheels were perfect for the pumped up NSX, but Michael wasn’t done yet. 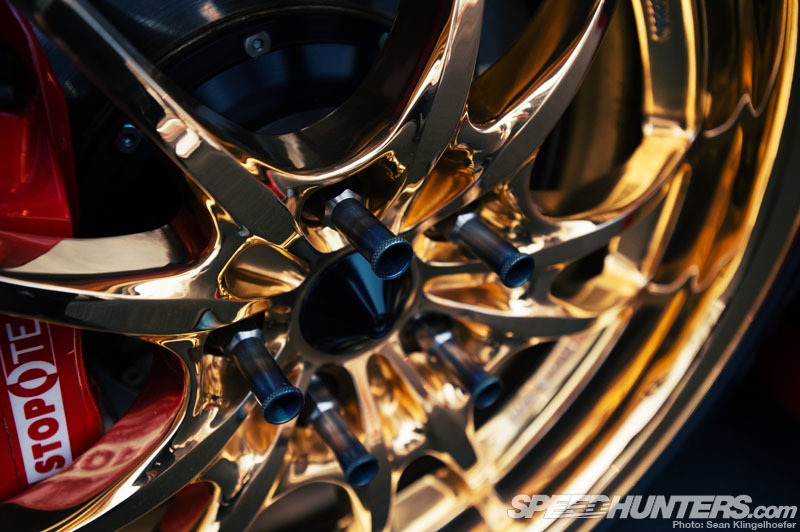 When it came time to finish the wheels, he chose a very unique ’24K gold’ color. 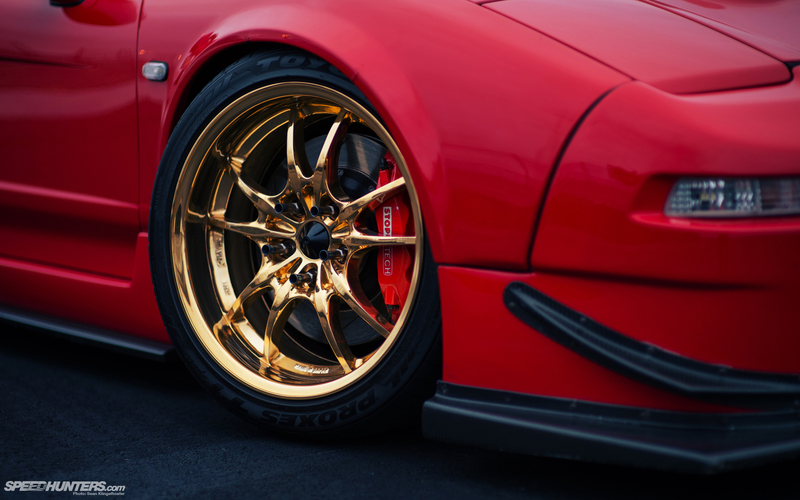 On paper the idea of putting 24K gold wheels on a legendary sports car like the NSX might sound like a recipe for disaster, but as you can see in the photos the finished result works quite well. Also, I don’t think Michael has to worry about showing up to a meet or car show where the guy next to him has the same exact wheels. In the cockpit, the mix of custom street car and competition elements continues. 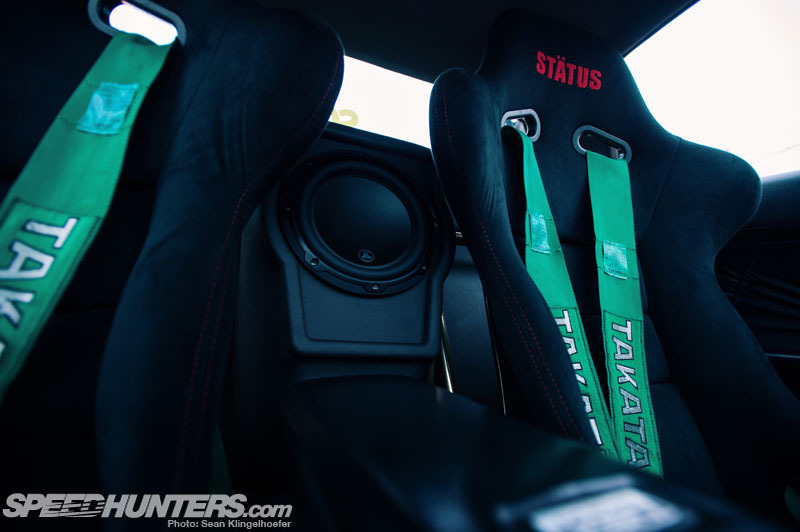 The bucket seats are limited edition items from Status Racing and are equipped Takata four-point harnesses. Takata’s green is, of course, a color that will always be associated with the NSX and its JGTC roots. 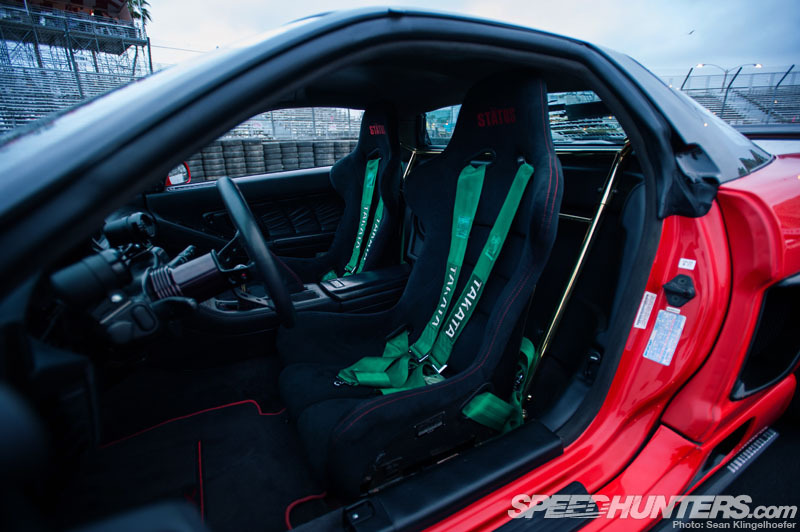 The interior is full of other little details as well – a DownForce center console, Mugen shift knob and pedals, and Zanardi Edition floor mats. The limited edition Vision steering wheel by ATC is another rare item sourced from Japan and the perfect finishing touch for the cockpit. Michael also likes his cars to have high end audio systems, and it was quite a challenge to fit this equipment inside the car’s tight cabin without anything looking out of place. The idea of having such a thing in a car like an NSX might sound strange to some, but that’s one of the reasons this car is so interesting. 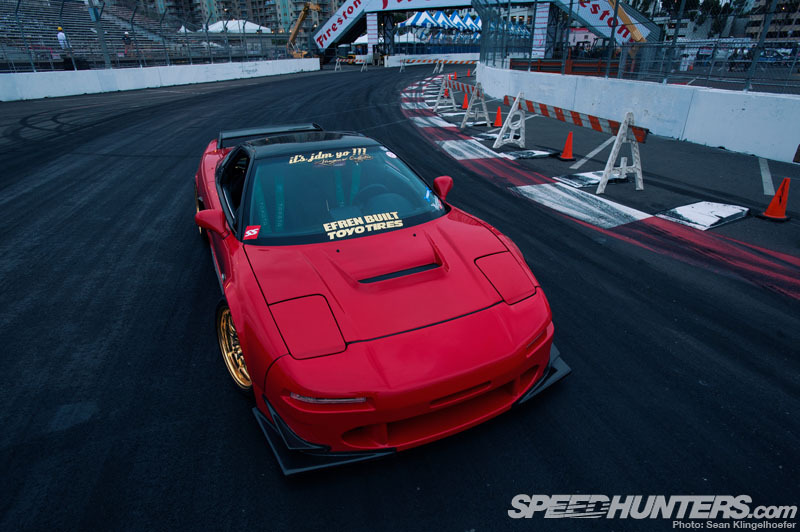 Michael has not only obtained his dream car, he’s also built it into one of the most unique NSXs in the world. 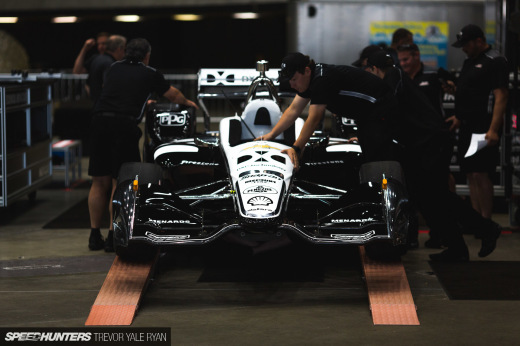 It’s Honda’s halo car with a good bit of extra horsepower and strong dose of SoCal street style. It’s no surprise then to hear Michael say that he plans to keep the car forever. Its because they aren't used to building a car for their tastes. My biggest pet peeve in the car world is modifiers that worry about resale value and the ones that only do what's good enough. You don't make a unique show stopper or speed demon thinking like that. You only get "good enough for close to stock." With that thinking.